Hanoi (VNA) – Government members looked into socio-economic performance in July and seven months during a regular meeting in Hanoi on August 3. The Ministry of Planning and Investment (MoPI) said the consumer price index in July was up 0.31 percent from December 2012 and 0.11 percent from the previous month. Credit growth was up 8.92 percent and 8.02 percent, respectively from December 2016 and last year’s same period. Industrial production expanded by 6.5 percent while manufacturing and processing grew by 10.6 percent. The total retail and services recorded a 10 percent growth. As many as 7.24 million foreigners visited Vietnam during the period, marking a 28.8 percent increase year-on-year. The total new and additional FDI capital was estimated at 21.9 billion USD in seven months, up 52 percent annually. The disbursement rose 5.8 percent to 9 billion USD. 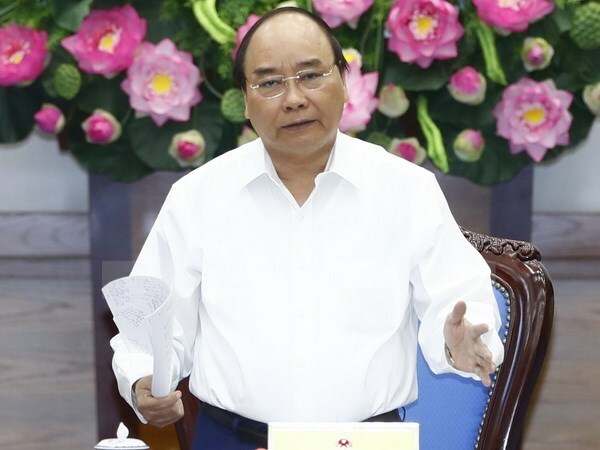 Concluding the meeting, Prime Minister Nguyen Xuan Phuc urged for drastic and synchronous actions to be taken between now and the year’s end to achieve set targets, improve business climate and build a constructive and service-oriented administrative system. He assigned specific tasks to ministries and agencies. Accordingly, the MoPI must be responsible for updating growth scenario to submit to the PM before August 20 to devise proper policies towards each sector. The PM asked the State Bank of Vietnam to continue adjusting the monetary policy towards reducing lending interests and increasing the credit outstanding balance by at least 20 percent. The gross domestic product (GDP) of the agricultural sector is expected to expand by three percent this year, while the exports of farm product and food should be 33 billion USD or higher. He pointed to slow equitisation of State-owned enterprises, asking for screening bottlenecks, handling stringently violations, and divesting State capital in listed enterprises.